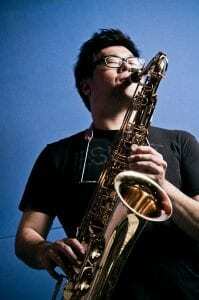 Shen-Yu Su (born in 1985, Taipei, Taiwan) is a famous Jazz saxophonist in Taiwan. When Su first started playing his saxophone at the age of 12, he learned to play pop and classical music. At the age of 19, Su realized that he could most easily express himself playing Jazz music so he strengthened his conviction to be professional Jazz musician. Due to the great diversity of music learning, Su’s performance styles are multiple and unique. Because of the passion of learning, Su went on to study Jazz saxophone at Royal Conservatorium Brussel in Belgium with the most revered masters of the saxophone: John Ruocco and Jeroen Van Herzeele. This was a mind-blowing experience for him. After majoring in jazz saxophone performance for three years at the Royal Conservatorium Brussel, Su started to popularize Jazz music in Taiwan. Not only joining live concert tours with many famous artists, but also dedicating himself to Jazz saxophone education. Shen-Yu Su has preferred JodyJazz mouthpieces for a long time as he really likes the tone.